Lieutenant Colonel Wadle entered the Marine Corps upon graduation from the U.S. Naval Academy in 1994. Graduating with distinction from TBS, he reported to Pensacola, FL for flight training. He received his wings of gold in October 1996, and was selected to fly the CH-53E. After completing FRS training at HMT-302, First Lieutenant Wadle was assigned to HMH-464 in July 1997. He served as the Logistics Officer until October 1998, when he was transferred to HMM-365 (REIN) as the ACE for the 26th MEU. Captain Wadle served as the Flight Line Officer during LF6F 2-99 and participated in Operation ALLIED FORCE in the Former Republic of Yugoslavia and Kosovo and Operation AVID RESPONSE in Turkey following several massive earthquakes. Returning to HMH-464 in November 1999, his billets included Squadron WTI and Assistant Operations Officer. In 2001, Captain Wadle transferred to HMT-302 where he served as FRS Instructor Pilot, Airframes Division Officer, and Quality Assurance Officer. 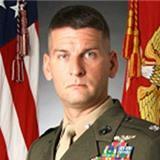 In August 2002, he was selected as the Aide-de-Camp to the Commanding General, 2d Marine Aircraft Wing. In 2003, Captain Wadle reported to the U.S. Naval Academy where he was assigned as both a Company Officer and as an instructor in the Leadership, Ethics, and Law Department. During his tenure at the Naval Academy, he was selected as the Outstanding Adjunct Faculty Member for two consecutive years. In 2006, Major Wadle returned to HMH-464 and assumed the duties of Aircraft Maintenance Officer. In 2007, he deployed to Djibouti, Africa as the Operations Officer for HMH-464 Detachment Alpha, Combined Joint Task Force Horn of Africa. In 2008, he transferred to HMM-264 (REIN) as the ACE for the 26th MEU. He served as the CH-53E Detachment Officer in Charge and the Assistant Operations Officer. Once deployed, his detachment traveled to Al Asad Air Base and joined Multinational Forces-West in support of Operation IRAQI FREEDOM for five months. While in Iraq, Major Wadle served as the Operations Officer for HMH-462 and as the Executive Officer for HMH-466. Upon return, Lieutenant Colonel Wadle transferred to HMT-302 where he served as the Executive Officer until June, 2010. Lieutenant Colonel Wadle is a graduate of the Weapons and Tactics Instructor Course, an honor graduate from both the Aviation Maintenance Officer Course and the Aviation Safety Officer Course, and holds a Masters Degree from the Naval Postgraduate School in Leadership and Human Resource Development. His personal decorations include the Bronze Star Medal, Air Medal with bronze 3, the Joint Service Commendation Medal, the Navy and Marine Corps Commendation Medal with gold star in lieu of second award, the Joint Service Achievement Medal, and the Navy and Marine Corps Achievement Medal with gold star in lieu of second award. In 2009, Lieutenant Colonel Wadle received the Alfred A. Cunningham Award as the MCAA Aviator of the Year. Check out the incredible speaker line-up to see who will be joining Scott.